Yesterday was a crazy, crazy day… packed full of fun and friendship! I started early… picking up my car from the service department at the local Honda dealer before 8am. Then off to the beach, where I visited for a while with my friend Catherine. By 9am, I picked up my friend Tee Thompson and off to Panera Bread Company we went for breakfast! LOL, often our ‘breakfasts’ at Panera last for hours… but around 1030am the phone rang and it was our good friend Eva who was at a nearby surgical center with one of her DD’s. So… we got a little snack for Eva and went off to meet and support her. By 11am Eva’s DD was out of surgery, so I took Tee back to her house and left for a scheduled meeting with a new friend ‘Kina’ at her stamp room and store. As we were wrapping up our visit… MY DD called and we agreed to meet for lunch at European Street Cafe (yum)! By 230pm I was back home, and although I should have set down to stamp, Instead cut out several new stamp images including the one used in today’s March ATC from Chocolate Baroque Rubber Stamps! Well, time flies when you’re admiring new stamps… right? It seemed like just a few minutes before DH walked in from work at 5pm!! LOL, so it was leftovers for dinner! And… of course my apologies to Esther as I’ve ruined her morning cup of Joe once again;) Chocolate Baroque is a stamp company from the United Kingdom if I remember correctly what Kina told me… and they’re great for coloring with Copic Markers or re-inkers and blender pens. This one is called Pretty Poppies. Today I’ve colored them using Copic markers to achieve very brightly colored floral images. I’ve also added Bee accents from Jolene, Dahlia’s, rhinestones and polka dot brads from Stampin’ Up! and Signo White Gel Pen dots in the background. Thanks so much for stopping by today, I look forward to reading your comments! That should read Tuesday Teaser Chicken Pasta Pesto Recipe and BLNT… but I ran out of space! Why Tuesday Teaser? LOL… this recipe is so delicious, your mouth should be watering right now!! Last weekend in celebration of our DD’s birthday, DH and I made one of her favorite recipes… Sicilian Chicken Pasta Pesto with Angel Hair Pasta. DH ‘mans’ the food processor portion, while I boil and grill. This recipe is very aromatic, and comes together REALLY fast ROFL… especially when you have two people working together!! Modified from an original recipe we found on America’s Test Kitchen, we’ve adapted it to fit our family’s fondness for Italian chicken dishes with a bit of spice. 3-4 pepperoncini stemmed but seeds en tact. Toast whole almonds over medium high heat, stirring often… about 4 minutes, set aside to cool. Toasted almonds have such a delicious aroma and toasting adds SO much flavor too! Tip… while waiting for them to cool, get that pasta water ready… it takes a while to boil!! Place the first 6 ingredients into the food processor… you may have to work in batches, scraping down the sides and pulsing until everything is liquefied. Heat 1 TBSP EVO Light until hot (it will just begin to smoke) and then toss in cut up chicken breast. Sprinkle with Rosemary-Herb seasoning and toss chicken to coat. Cook until juices run clear… about 3-5 minutes. If you can multi-task, you can add your pasta to boiling water while cooking the chicken breast… LOL, if not… then do it now! Be sure to cook the pasta Al-Dente according to package directions. When pasta is done, pour off 1 cup liquid and set aside before draining the rest of the liquid. Put the drained pasta back into the pan and add Pesto Sauce, tossing with noodles… if it’s really thick and gummy add a bit of the reserved pasta water to thin. Add the cooked Chicken to the pasta and it’s ready to serve… LOL you could serve right from the pan or plate it if you’ve got company!! This dish is really yummy, but not too pretty, LOL… it would be much prettier if we simply topped the pasta with the chicken and then pesto…. but then the sauce wouldn’t give the noodles the lovely well coated flavor! We usually serve this dish with a fresh green salad… but last weekend we changed it up a bit adding Warm Tuscan Farro Salad as our side.. Kale was never so delicious…yum! I’ve got a little Kale left over, and am going to make microwave kale chips today… should be interesting! One of my favorite breakfast ‘treats’ is half of a bacon lettuce tomato sandwich on sourdough toast…. LOL, today's Tuesday Teaser recipe uses a LOT of tomatoes and so this morning my sandwich was missing the Tomato… Bacon Lettuce NO Tomato (BLNT)… it’s just not the same!!! I’d love to write a food blog, LOL… but where oh where would I find the time? I’d have to give up stamping, and that’s not going to happen anytime soon! Plus just writing about dinner made me hungry!! Luckily these dishes are both very good served cold, I think I’ll have a quick bite! It’s raining, it’s raining… and it’s not a commercial… but I’m in great need of inspiration on this dark and dreary day!! Guess I will go check out some challenges to see if I can spark my creativity and get some stamping done :). See you tomorrow with a new stamped project or card! I look forward to reading your comments, and thanks for stopping by! Shop my online stampin’ up store for exclusive Stampin’ Up! Paper, Card Stock, Ink, Terrific Tools and Awesome Color Matching Accessories for your paper crafting needs! It’s all in our perception…. how we look at something, how we perceive it starts in our heads! Today’s CAS card for Senior Stampers reminded me of that and was good for a laugh or two too! During the Senior Stamping sessions, the card sample is placed in a protective sleeve and set on the table as a suggestion for them to follow when creating their card. 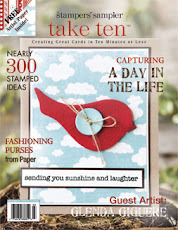 Last week I heard some giggling from one end of the table as one of the stampers removed the card from the protective sleeve and propped it standing and open on the table top. LOL… it may have been rotated 180 degrees with the sentiment at the bottom… but either way it was cause for giggles. They thought I had glued the sentiment onto the card incorrectly… NOT that it couldn’t have happened that way… BUT… My card was made to stand vertically. More laughter of course as they realized the card could go either way, it was just a matter of perception and where/how they decided to place the sentiment! Isn’t it funny how our minds can play tricks? It’s all in our heads! I hope you enjoyed the quick and easy simplicity of today’s card, and look forward to reading your comments! ** This item, featured on page 7 of the Stampin’ Up! Holiday Mini Catalog 2012-13 is still available for ordering. 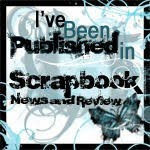 Visit my online stampin’ up! store to order items used on today’s Clean and Simple Card for Seniors and more!